After creeping about five football fields across the rocky floor of Gale Crater on the way to an intriguing intersection of different terrain types, the Mars Curiosity rover is pausing for a few weeks near fine-grained sand dunes to scoop up soil and run it through the vehicle's sample acquisition system to clean out lingering traces of Earth's environment. After three such "rinse and repeat" cycles, a scoop on the end of the rover's robot arm will deposit small samples into a pair of sophisticated laboratory instruments, the Chemistry and Mineralogy experiment, or CheMin, and the Sample Analysis at Mars instrument, known as SAM. CheMin will use X-ray diffraction to identify the minerals in a sample while SAM will employ two spectrometers and a gas chromatograph to look for signs of organic compounds. 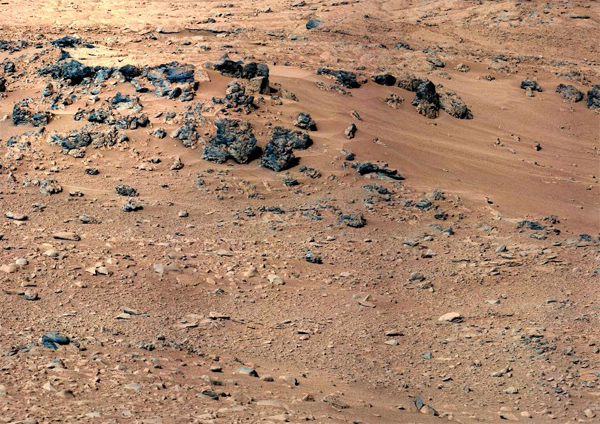 But first, all traces of Earth's environment must be cleaned away to eliminate any chance of contaminating a Mars sample. "Even though we make this hardware super squeaky clean when it's delivered and assembled at the Jet Propulsion (Laboratory) ... by virtue of its just being on Earth you get a kind of residual oily film that is impossible to avoid," said Daniel Limonadi, a sampling system engineer at JPL. "And the Sample Analysis at Mars instrument is so sensitive we really have to scrub away this layer of oils that accumulates on Earth." 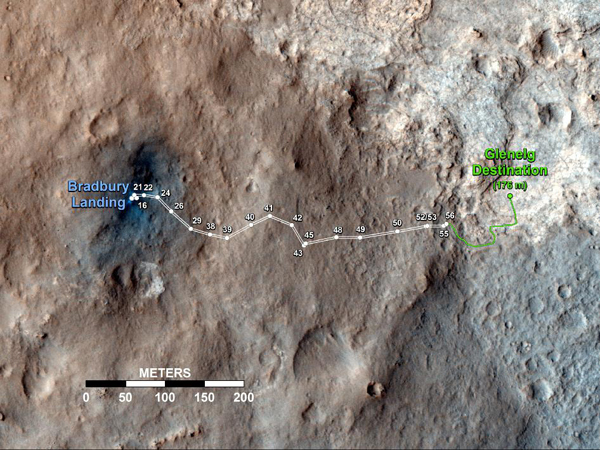 Curiosity has rolled about 1,600 feet since landing Aug. 6, heading toward an area known as Glenelg, where orbital photographs show three different types of terrain converging. Along the way, engineers have been testing and calibrating the rover's instruments and subsystems, snapping pictures and collecting data. Among the last items to be tested are a scoop on the end of the rover's robot arm and an impact drill. Both devices are designed to deliver soil samples to inlets on the top of the rover's body leading to the SAM and CheMin instruments. Engineers have been looking for fine-grained sand to test the scoop system and to clean out its internal components. And they found what they were looking for in a site dubbed Rocknest, a football field shy of Glenelg. Rocknest measures about eight feet by 16 feet and features dune-like deposits of sand as well as a variety of exposed rocks. "What we're doing at the site is we take the sand sample, this fine-grained material and we effectively use it to rinse our mouth three times and then kind of spit out," Limonadi said. "We will take a scoop, we will vibrate that sand on all the different surfaces to effectively sand-blast those surfaces, then we dump that material out and we rinse and repeat three times to finish cleaning everything out. ... Our Earth-based testing has found that to be super effective at cleaning." The first scoop will be collected Saturday and if all goes well,the cleaning process will be finished in the next week and a half with part of the third sample being delivered to the CheMin instrument. A fourth sample then will be shared by both CheMin and SAM. With the scoop tests complete, Curiosity will continue on to Glenelg where its impact drill will be put to the test for the first time, probably sometime in November. While the scoop can collect soil samples from the surface, the drill will produce debris from the interior of targeted rocks, using the same delivery system employed by the scoop to reach the laboratory instruments. "Getting these samples is kind of the keystone of the rover mission," said Mike Watkins, a mission manager at the Jet Propulsion Laboratory. "We're being deliberately, incredibly careful. So not just taking (samples) but every time we take one, stop, open it up, take a look at it, make a video of us dropping it off. We're taking a lot of extra steps here to make sure we understand exactly what's going on, that we won't have to do every time we do a scoop in the future."